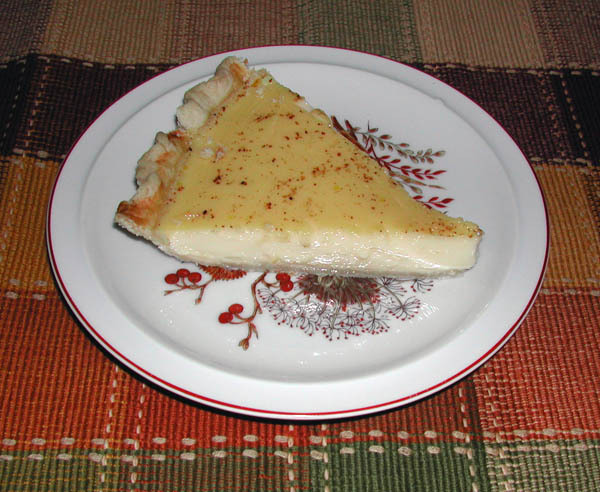 Custard pie is one of my personal favorites and this is a very good recipe, the author claims that this pie will not weep or bead up. Scalding the milk before using does help with this. According to the Joy of Cooking, to scald milk, heat in a heavy pan just till you see bubbles along the outside edges. You do not want the milk to boil. Pour slowly into the egg mixture to avoid cooking the eggs. This is a very simple, flavorful pie and not rich, it is good for a dessert after a large meal. Really takes me back to my childhood. I make custard cups quite often, but the pie really hits the spot. Preheat oven to 350°F. In a small saucepan, scald the milk over high heat, set aside. In a large mixer bowl, throughly beat the eggs, sugar, vanilla, and salt together. Add one cup of the hot milk to the egg mixture, beating it in slowly. Add the rest of the milk and continue top beat slowly. Pour the custard into the pie shell, and sprinkle with nutmeg. Bake on the lowest oven shelf for 40 minutes or until it is pale gold. Remove to rack and cool completely before cutting.